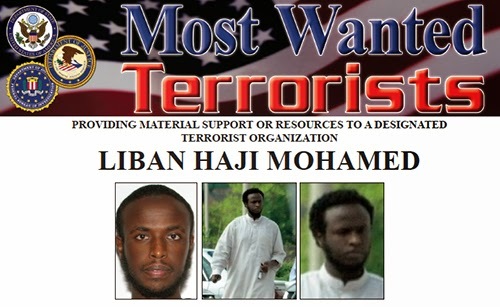 Liban Haji Mohamed, a naturalized U.S. citizen born in Somalia, has been named to the FBI’s list of Most Wanted Terrorists, and a reward of up to $50,000 is being offered for information leading to his arrest and conviction. Mohamed is charged with providing material support and resources to al Qaeda and al Shabaab, a Somali-based terrorist organization. Traveling with his U.S. passport, Mohamed is thought to have left the United States on or about July 5, 2012. Before his departure, the 29-year-old lived in the Northern Virginia suburbs of Washington, D.C., where he worked as a cab driver. A federal warrant for Mohamed’s arrest was unsealed today by the U.S. Attorney’s Office in the Eastern District of Virginia. In addition to today’s announcement adding Mohamed to the terrorist list and offering a reward for information leading to his arrest and conviction, the FBI is publicizing the case on social media channels in Somalia and elsewhere to encourage people to come forward with information about the fugitive. Shortly after leaving the U.S, the international police organization Interpol issued a blue notice for Mohamed to collect additional information about his identity, location, and activities. On August 15, 2014, Interpol issued a red notice to seek him as a wanted fugitive. Mohamed speaks English, Somali, and Arabic. He is black, 6 feet tall, weighs about 194 pounds, and has black hair and brown eyes. He could be using aliases including Abu Ayrow, Shirwa, Shirwac, Qatiluhum, and Qatil. Mohamed was a close associate of convicted terrorist Zachary Chesser, who was sentenced in 2011 to 25 years in prison for attempting to provide material support to al Shabaab. There are currently 31 individuals on the FBI’s Most Wanted Terrorists list. Those on the list have been charged in the U.S. for their alleged involvement in various terrorist attacks or planned attacks around the world against U.S. interests or persons. The FBI also announced today it is seeking information about another individual, Ghazi Nasr Al-Din, regarding fundraising efforts on behalf of the terrorist group Hizballah (see sidebar). Anyone with information about Liban Haji Mohamed or Ghazi Nasr Al-Din should contact the FBI or the nearest American Embassy or Consulate. Tips can be submitted anonymously online.